Norway has an ambitious plan to ease the congestion of local ferries by building a series of underwater tunnels that allow travelers to cross the nations bodies of water. 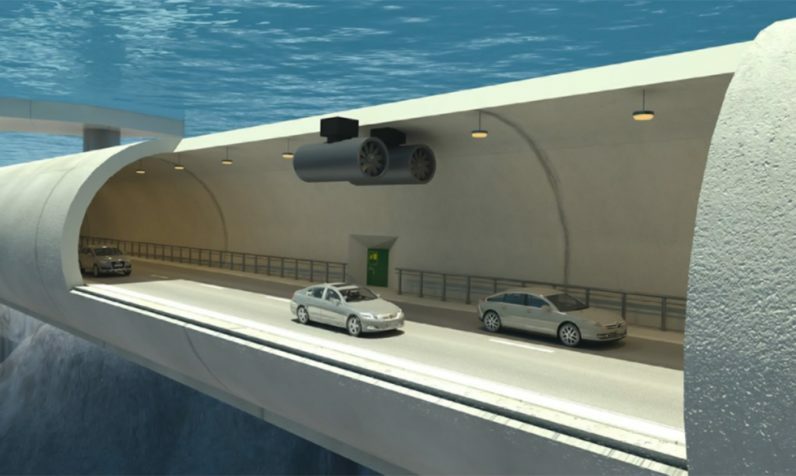 The “submerged floating bridges” would consist of large tubes suspended by pontoon-like support structures 100 feet below water. Each will be wide enough for two lanes of traffic, and the floating structures should ease the congestion on numerous ferries currently required to get commuters from Point A to Point B. Each support pontoon would then be secured to a truss or bolted to the bedrock below to keep things stable. Currently, a trip from Kristiansand to Trondheim (680 miles) could take as long as 21 hours due to the seven ferry trips required along the way. This inefficient means of travel is largely due to the countries fjords and difficult terrain, the prime factor in selecting ferries over bridges as a means to travel across water. This $25 billion tunnel project could cut the trip time to just 10 hours by 2035. With 1,150 traffic tunnels already in use throughout Norway — 35 of which are submerged below water — the new bridges should be relatively familiar with Norwegians. As for why a normal bridge — a significantly cheaper alternative to the planned $25 billion in funds needed to complete the project — wasn’t considered, the terrain in the region makes it unsuitable for your typical bridge.